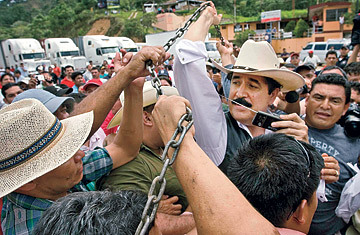 Ousted Honduran President Manuel Zelaya (C) holds up the chain which marks the border between Honduras and Nicaragua with his supporters at the border point of Las Manos in Honduras, on July 24, 2009. 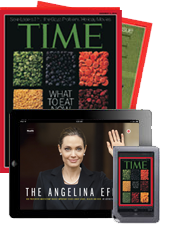 The scene at this sweaty central American checkpoint was grand political theater. On July 24, ousted Honduran President Manuel Zelaya, threatened with arrest if he ever again set foot in his homeland, ducked across the border before crowds of media and supporters--and then rapidly strode back into neighboring Nicaragua to set up camp. The action put Honduras' political crisis back in the headlines, and it set tensions boiling and troops firing tear gas on Zelaya's supporters nearby, prompting U.S. Secretary of State Hillary Clinton to dub the move "reckless."